The Beatles’ ground-breaking 1967 Sgt. Pepper’s Lonely Hearts Club Band album is the inspiration behind Mark Morris Dance Group’s (MMDG) Pepperland, presented by co-commissioner Dance Consortium and touring across the UK and Ireland between 20 March and 1 May 2019. It comes to the Alhambra Theatre, Bradford on Tuesday 2 and Wednesday 3 April 2019. 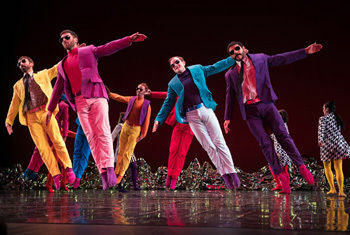 Pepperland is legendary choreographer Mark Morris’ unique tribute to the 50th anniversary of the release of the iconic LP. Hailed as the first-ever ‘art rock’ album and widely regarded as the best rock and roll album of all time, it spent 27 weeks at number one on the UK Albums Chart and 15 weeks at number one in the USA. It won four Grammy Awards in 1968, including Album of the Year, the first rock LP to receive the honour. Mark Morris is renowned as an intensely musical choreographer and is undeviating in his devotion to music. The New York Times said Morris is the “most successful and influential choreographer alive and indisputably the most musical”. Since founding MMDG in 1980, he has created almost 150 works for the company, many of which are widely considered masterpieces. Now, set to tour across the UK and Ireland for the very first time – London, Birmingham, Salford Quays, Bradford, Edinburgh, Canterbury, Cardiff, Plymouth, Southampton, Norwich, Newcastle and Dublin - Pepperland features an original score by composer Ethan Iverson, inspired by some of the album’s most enduring hits: Sgt. Pepper’s Lonely Hearts Club Band; With a Little Help From My Friends; A Day in the Life;When I’m Sixty-Four; Within You Without You; and Penny Lane. Iverson’s fresh arrangements of the original tracks will be performed live by MMDG Music Ensemble - Pepperland‘s unique chamber music group - and is interspersed with six original Pepper-inspired pieces that complement Morris’ profound understanding of classical music styles of allegro, scherzo, adagio, and the blues. The septet music ensemble is led by Iverson on piano. Best known as long-time pianist with the trio Bad Plus, which he left last year, Iverson was selected by Time Out New York as one of 25 essential New York jazz icons, “perhaps NYC’s most thoughtful and passionate student of jazz tradition—the most admirable sort of artist/scholar.” For Pepperland he is joined by New York City’s finest musicians specializing in voice (Clinton Curtis), theremin (Rob Schwimmer), soprano sax (Sam Newsome), trombone (Jacob Garchik), organ/harpsichord (Colin Fowler) and percussion (Vincent Sperrazza). Costume designer Elizabeth Kurtzman has designed numerous pieces for MMDG, including Dancing Honeymoon, Sang-Froid, The Argument, Greek to Me, Four Saints in Three Acts, Empire Garden, Visitation, Crosswalk, Petrichor and Pure Dance Items. Her bright, candy-coloured costumes, often splayed in geometric patterns, recall the swinging sixties as Morris’ dancers evoke the freedom and energy of a time that revolutionised social and political norms. Community engagement is a vital component of MMDG’s work. The group integrates opportunities for dance, music, talks, and education at its Brooklyn home, the Mark Morris Dance Center, as well as on tour around the world.